The storyline of this week’s Haftorah: The Haftorah starts with Shlomo (Solomon) awakening from the dream in which he asks for wisdom from Hashem. 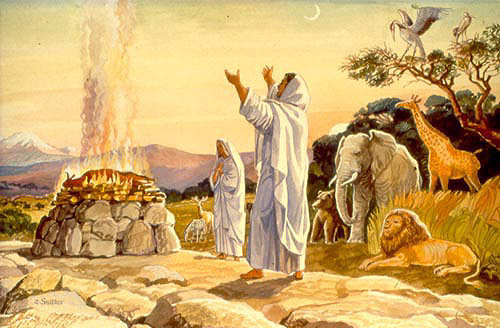 He goes to the Holy Temple where he offers sacrifices to Hashem, and makes a feast for his servants. The Haftorah continues with a test of his newfound wisdom. Two women approach Shlomo Hamelech (The King) claiming a small baby as their own. One tells the story that she was sleeping and that the other woman, having rolled over on her baby by accident, killing him, came into her room and switched the dead baby with her live baby. In the morning, she did not recognize the baby she held and she realized that the dead baby was not her own. She then begs to have her son returned to her. The other woman objects and claims the story is the other way around. Shlomo comes up with the solution; he calls to his guard to fetch him a sword so that he may divide the baby in half. The true mother cries out and says to give the baby to the other woman, she would rather he be given away than killed. The other woman, however, says, “Neither mine nor yours shall he be. Cut.” (3:26) The King proves his wisdom with this clever ruse for he has now determined the baby’s true mother. Shlomo Hamelech declares the true mother as the one who tried to save her son by giving him to someone else. When Bnei Yisroel heard this story, they stood in awe of the wisdom bestowed on Shlomo by Hashem, and they all accepted him as their King. Was crowned as king at the age of 12! Shlomo ruled for 40 years and passed away at the age of 52. As King, he led the building of the Bait Hamikdash, starting at 16 years of age, which lasted for 7 years. He was extremely wealthy; by some estimations his wealth increased by $250 million dollars a year. Shlomo was famous for his stables which housed 40,000 horses and 12,000 horsemen. King Shlomo had 700 wives and 300 concubines. Is quoted as the smartest man to ever live. Shlomo was able to give 3,000 explanations to every Pasuk in the Torah. He knew all 70 languages spoken in the world at that time as well as possessing the ability to communicate with all the living creatures in the animal kingdom. Once the Queen of Sheba traveled 7 years by caravan just to meet him and quiz him with regards to his wisdom. After their first meeting, the Queen of Sheba remarked that the King was much wiser than his reputation had suggested. Instituted, among others, the two mitzvot of Eiruv and Nitelat Yadayim. The Eiruv is a string surrounding an outer perimeter of an area thus designating it as a permissible place to carry things on Shabbat. He also made it customary for people to wash their hands before eating bread. Famous Phrases: Mishlay, Proverbs 1:8, “Shema bini musar avicha, v’al titosh torat imecha” “hear, my child, the discipline of of your father, and do not forsake the teaching of your mother”. This is recited daily upon awakening, as a continuation of the morning prayer “Modeh ani”. Haftorahman’s lesson of the week: We may think that there is a cause and effect with our actions and successes. Yes, there is a concept of hishtadlut (effort); however, we must acknowledge that G-d is the one and only source of all blessings. One of the Ten Commandments is, “Thou shalt not be jealous.” What is so bad about jealousy? Someone has something you like and you want it. However, when a person envies what another has, it is showing that he is not happy with his lot. The notion that a person is not satisfied with what Hashem has given them is an insult to Hashem. It is G-d’s decision what we have and what others have. Do not second guess G-d. It is best to focus on being Sameach BiChelko (Happy with what you have). From time to time, it is good to do the following exercise. Say to yourself, “I have a lot to be grateful for!” Then make a list. Think about your friends, your health, your family, and your livelihood. Focus on what you have and be thankful for all of it.